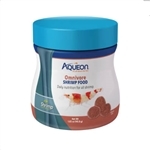 Aqueon Herbivore Shrimp Food is ideal for freshwater shrimp and crustaceans like crayfish. These sinking discs are approximately 9 mm in diameter so multiple shrimp can feed at a time. Formulated with no fish meal to mimic a more natural diet and boosted with color enhancers and bentonite clay for exoskeletal development. The Aqueon Omnivore Shrimp Food is a protein-based food, ideal for shrimp in the Genus Caridina, such as Crystal and Bee Shrimp. The higher protein levels are also beneficial for shrimp carrying eggs, commonly known as “berried”. The Aqueon Omnivore Shrimp Food is a plant-based food, ideal for shrimp in the Genus Neocaridina, such as Cherry and Blueberry Shrimp.